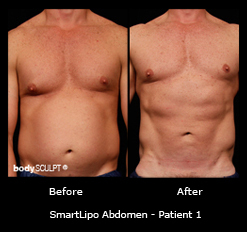 Smartlipo Triplex hi def liposuction procedure performed at bodySCULPT® is a highly effective aesthetic procedure that provides a slim, athletic and muscular appearance. The treatment is particularly ideal for men seeking superior abdominal muscle definition or six-pack abs and a ripped chest, and women who want a sleek, trim abdomen and waistline. Specialized in liposuction procedures, our plastic surgeons use advanced SmartLipo Triplex technology to provide you with customized hi-def body sculpting solutions. 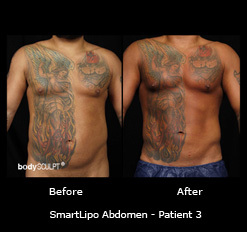 They have performed the highest number of Smartlipo laser liposuction procedures in the country. As the procedure is performed under local anesthesia, you can benefit from faster recovery compared to traditional procedures. Our surgeons are also leaders in the use of local anesthesia for several procedures. Take a look at the before and after photos of our patient, who achieved more targeted and well-defined results with our hi-def liposuction procedure.